A common question that often comes up is "how do I manually calculate hours worked from my time clock?". Calculating work hours can be tricky. Today we would like to explain how to calculate your work quickly using basic math. For those who do not enjoy math, we provided a free time card calculator and decimal hours to hours and minutes converter, these free tools will make calculating hours a breeze. There are two methods for calculating hours worked. The first is manually calculating hours, and the second preferred method is using a "time clock software." Performing manual math calculations can be timely and error-prone; while OnTheClock's business time clock handles all the calculations for you. There are various methods for calculating employee hours worked. The most common involve recording start time and end times for hours worked. Some employers, require their employees record their hours on paper, while others use a punch clock system to log hours. Once work hours are recorded, the employer will need to tally up the totals for payroll. Here we are going to explain how to manually calculate hours worked. To do this, you will need a start and end time. The goal is to determine an entire duration worked using the recorded hours and minutes. For example, starting @8:30 am and ending @3:45 pm would result in 7 hours and 15 minutes worked. Convert 8:45 am to 08:45 hours. Convert 3:45 pm to 15:45 hours. Next, Subtract the start time from the end time. Now you have the actual hours and minutes worked for the day. Finally to determined total wage, you will need to convert this to a decimal format. In the previous example, we explained how to figure total hours worked for the day. To determine your total employee wage, you will need to convert the total hours and minutes into a decimal format. Once converted, you can simply multiply employee (time worked * wage) to determine gross pay. For example, if an employee works 8:30 minutes, this is 8.5 hours when converted to decimal, multiply it by their hourly wage; this results in a gross wage amount. 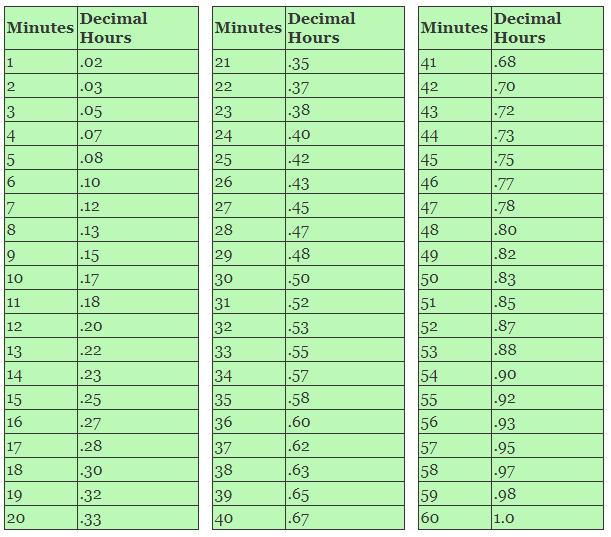 Below is a chart that will help you to determine minutes to decimal conversions quickly. Pen and Paper time cards. Writing down work hours is not a new concept. In fact, archeologist found evidence of ancient civilizations recording time back to 6000BC. Manually recording hours on a substrate has worked for a very long time. However, in today's world, there are strict rules, regulations, and legalities. The Department of Labor has suggestions on how employers should track employee hours, writing hours down is an entirely acceptable solution. Important note on handwritten time cards. Should the employee report wage shortages to the Department of Labor, the DOL may rule in favor of the employee if they have a perfect 40 hour week, every week. The DOL would consider a perfect 40 hour work week "unrealistic hours" because they're too perfect. A conventional time clock is a mechanical device that stamps the time and date onto a paper timecard. The employer will give each employee a time card for the pay period; it is the employee's responsibility to place the time card in the machine and punch the time card whenever they arrive or leave work. The employer will tally up the hours worked, the employee is turn paid based on the hours worked. There is an assortment of free online time card calculators on the internet. These time clock calculators handle the necessary calculations required to determined hours worked. Often, they function a lot like a spreadsheet, allowing you to fill in the information and it calculates total hours for you. OnTheClock offers a few different time clock calculators that may find helpful. Time card calculator with lunch and overtime. Convert hours & minutes to decimal hours. Convert decimal hours to hours and minutes. Employee attendance and time off tracking. Advanced GeoLocation and Job Costing features. Send employee hours directly to payroll software. Mobile and browsers apps for simplicity. This article reviewed a lot of options for tracking employee time. While the U.S. Department of Labor does not enforce how employers track employee hours, it does provide guidelines to track employee hours accurately. Regulations that state how long an employer must retrain payroll related data. Currently, employers are required to retain timecards and payroll related calculations for at least two years during and after employment. A complete list of wage-related information is located on the Department of Labor website dol.gov. Please help me to figure my hours up to military time. I worked 4:03-11:00pm and I don't understand how my employer came up with 6.95 hours? My calculations: 5x12 = $60 20 minutes x 12 = $4 =$64. I work 4pm to 9.20pm. Time card machine calculations: 16:00 - 21:20 = 5.20 5.20 x 12 = $62.40. Can you please help me out why there is difference between my calculations and time card machine calculation? reply from OTC - Hello Debrah, We are very happy to hear we could assist students understand mathematics. Hi at my work i arrive at 4.15 but wen they calculate my hours they start to calculate at 5.00 please i need help to that. Hi, what do i do when my employer pays me less than a basic salary every month? reply from OTC - Hi Eric, Thanks for reaching out to us. Are you being paid less than you should be for your worked hours? You also mention salary, if your on salary then you should paid the same each month. Your gross pay for the year should match your salary contract. I'm am finding my employer shorting me hrs. Is it legal for a company to pay you for 37 hours and they make you work 40 hours. How does the clock software calculate overtime for employees? How about the week which has a statutory holiday? Hi Lesley, The OnTheClock software provides a list of predefined overtime rules. The employer will select the overtime rule that best fits their overtime requirements. Employee hours and overtime are automatically by the software. I can reach out to you directly to see what your requirements are and how we can help.